I first participated in Stepping Out To Celebrate Life as a model in 2003, and then volunteered for model committee roles since then. This participation has brought so much joy to my life, as well as a wonderful community of amazing women! I have always liked that To Celebrate Life Breast Cancer Foundation focused on giving to make survivors’ lives easier and happier. There are many organizations that focus on fundraising for research, but fewer that focus on quality of life after treatment. I have now, unfortunately, had an opportunity to learn firsthand of what our contributions mean, and to benefit personally from the services that To Celebrate Life Breast Cancer Foundation makes possible. Just 17 days after celebrating my 15th anniversary of being cancer-free, I was diagnosed with a small, new breast cancer in my other breast. I was fortunate that it was caught early and that all its metrics were not aggressive. Because of the mental challenges I faced with this cancer, I sought out assistance as it was offered, especially around stress reduction. Both times I did, I was offered additional services because I had breast cancer—services funded by grants from To Celebrate Life Breast Cancer Foundation . I had guided imagery sessions and wonderful free massages. 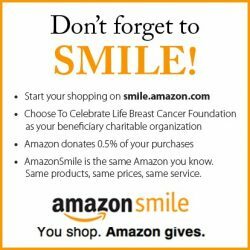 Both of these services, which were made possible by To Celebrate Life Breast Cancer Foundation, helped me to feel cared for as a whole person. They truly helped me get beyond my early mental anguish and to find my positive outlook again. I am so grateful to you all. And I am prouder than ever to be part of this wonderful organization, and, going forward, to help give to others what was so generously shared with me. I look forward to many more years of working with you and the board, and learning so much from all of you. It gives my life added meaning. Thank you very much for sending me the letter and information brochure. I greatly appreciate it. Since I am soon becoming Bat Mitzvah, I am required to make several mitzvahs, or good deeds. Since breast cancer is an important and recognized problem, I have decided to take your advice and sell my denim bags at Precision. It was a lovely experience and Duc was very helpful and kind. From the bags, I have made $77. This amount is enclosed in a check. I hope that this will benefit your organization in some way, for I feel that you guys are doing a wonderful thing for society. I am so deeply grateful to have had the wonderful experience of being a model in this year’s Stepping Out To Celebrate Life event. The opportunity came at a moment when I needed it the most. I am currently in treatment for metastatic breast cancer. There have been so many assaults on my body – weight gain from steroids, thinning hair, eyebrows, and eyelashes, and a visible port on my chest. It was so difficult to feel attractive. You gave that back to me. I cannot thank you enough. “I hope you are aware of the joy and emotional healing you are providing for women who have and who have had cancer. I hope I can give back some of what I was given through volunteering. I would like to help any way I can. This organization should exist everywhere. 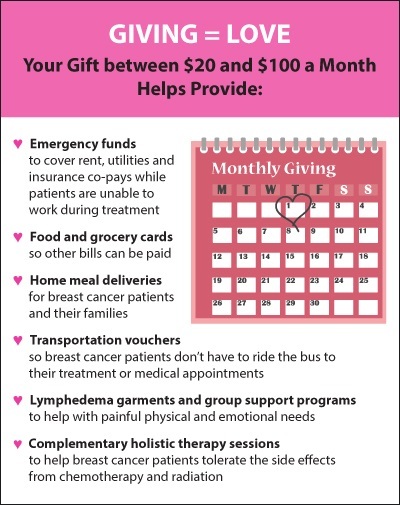 I want to take this opportunity to share with you how helpful the funds we receive from Marin Breast Cancer Council – now To Celebrate Life Breast Cancer Foundation – are to our hospice patients/families living with breast cancer. One of our patients with breast cancer who we have been able to assist during this funding period is a 91-year-old woman living in her own apartment. She has declined to the point where she needs 24-hour care, which she unable to afford. Her one wish is to be able to die in her own home. By utilizing the funds made available to us through your generosity, we are able to help pay for her round-the-clock-care, keeping her safe in her home and ensuring her that her final wish will be granted. This has provided her with both relief and comfort during this final stage of her life.